Friday’s are usually pizza nights for us, and this is slowly becoming a tradition at our home. Now that my husband and I have more time to devote to cooking, we are not any longer ordering pizzas. 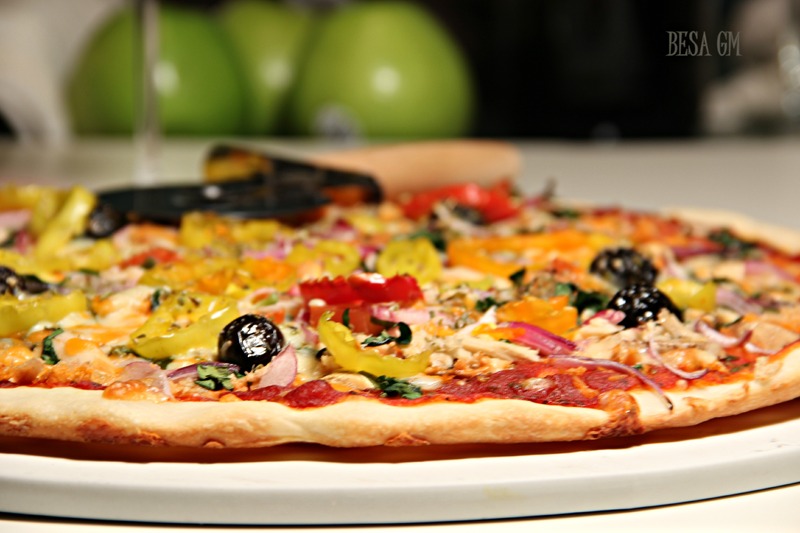 We are making our own delicious, thin crusted, fully loaded pizzas in our little kitchen, and we are loving them. In fact, my husband is now in charge of making them. 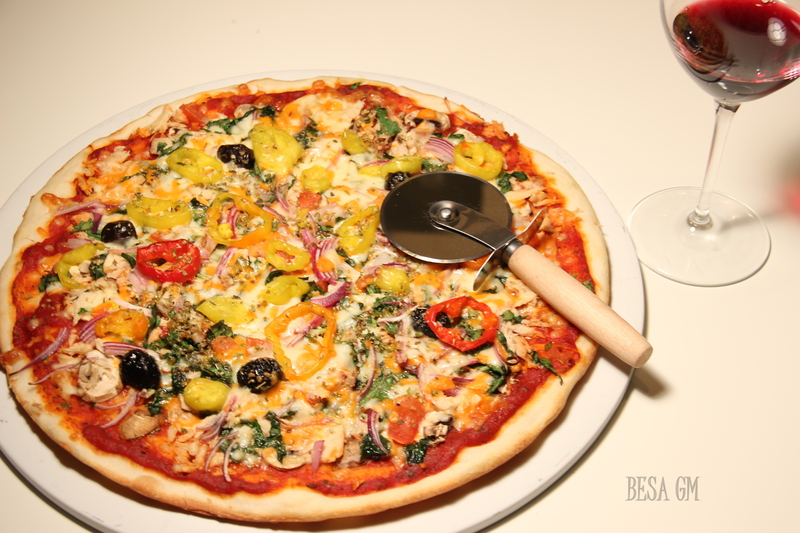 I only take part in throwing the dough ingredients in the mixer, and then wait for few hours to be served with delicious slices of custom made pizza. It doesn’t get any better than that, don’t you think? 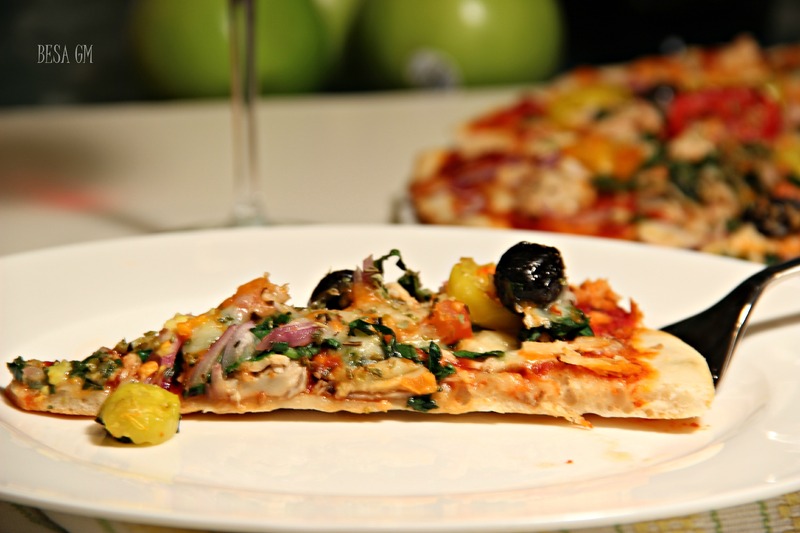 I used to make pizzas, but my husband thought that he could make them better and after the first pizza he made, I was convinced that he is definitely doing a better job than me, and I am sooo happy for that. 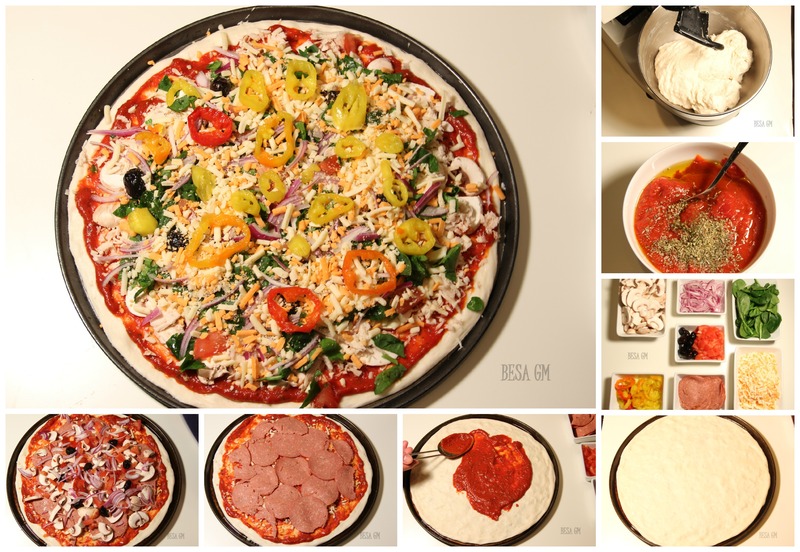 So here is the recipe and the photos of the pizza that we had last Friday. 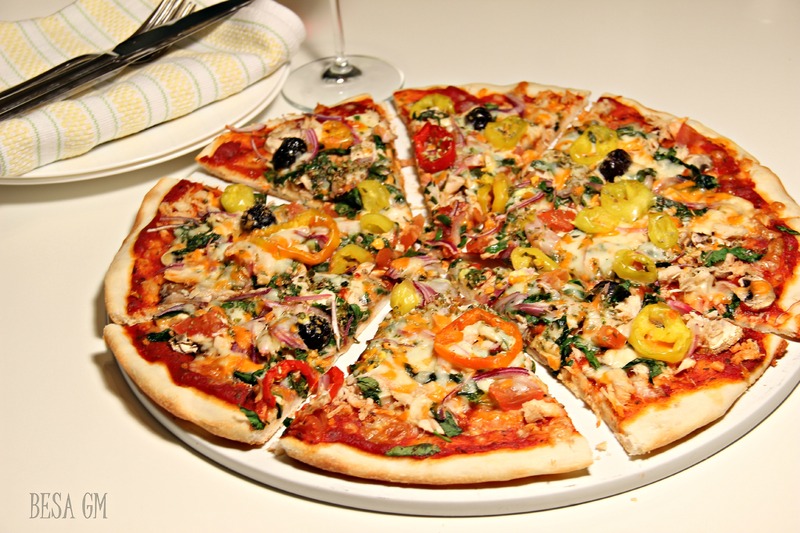 Shredded Mozzarella Cheese, pepperoni (or canned tuna) , mushrooms, peppers, chopped tomato, onion, spinach,olives. Sprinkle yeast and sugar over warm milk in a large bowl. Let stand for 5 minutes. Stir in salt, water, olive oil and then stir in the flour about 1 cup at a time. When the dough is together enough remove from the bowl, knead on a floured surface until smooth, about 5-10minutes. Divide into two pieces, and form each one into a tight ball. Coat the dough balls with olive oil,cover them with pastic foil and let stand for about 2 hours. Using one ball of dough at a time, lightly dust the dough with flour, place it in a pan and stretch gradually throughout the 16 inch pan. 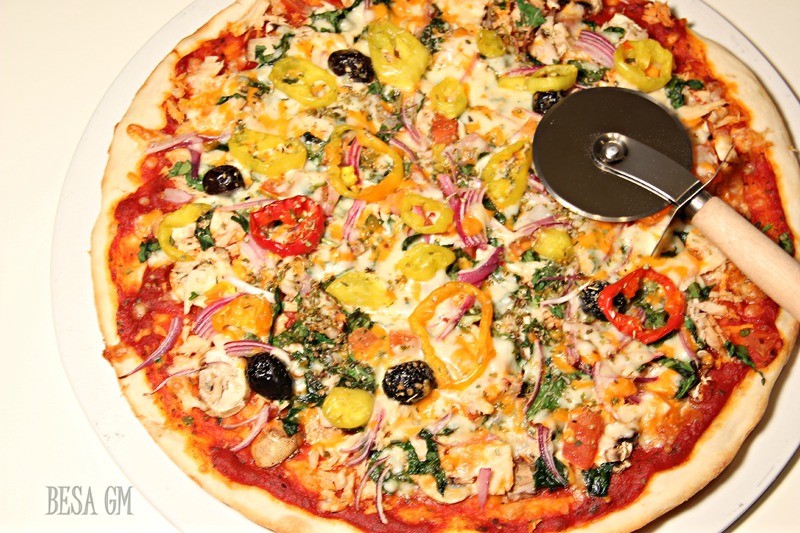 Using a large spoon, in circular motions, spread the sauce over the crust. Layer the crust with toppings of your choice and cover with shredded mozzarella cheese. Sprinkle with dried oregano. Bake for 17 minutes in 425 degrees F or until the crust begins to brown. Cut into wedges, serve and enjoy.